The General Insurance Corporation of India (GIC) on Monday donated a cheque of Rs 3 crore towards the Nagaland Chief Minister’s Relief Fund. 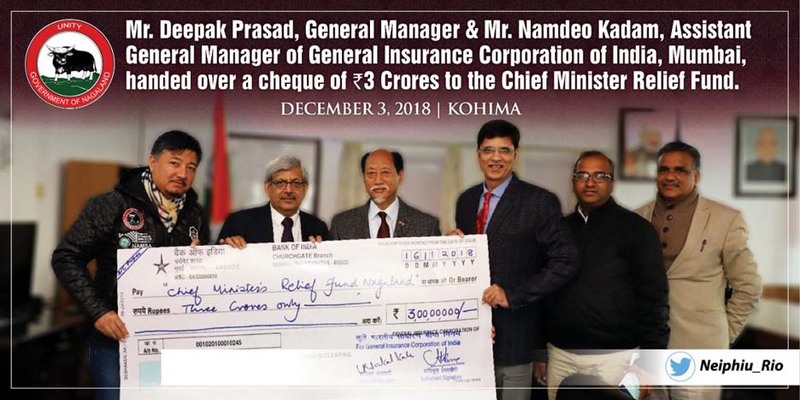 The cheque was handed over to Nagaland Chief Minister Neiphiu Rio by Deepak Prasad, General Manager and Namdeo Kadam, Assistant General Manager of General Insurance Corporation of India, Mumbai. Nagaland Chief Minister Neiphiu Rio has thanked General Insurance Corporation of India on behalf of the people of Nagaland, for showing concern and love with the contribution of the money. This year, the northeastern State of Nagaland witnessed unprecedented incessant rainfall resulting in major disaster and havoc affected the normal life of the people of the State. The Governor of Nagaland, PB Acharya, also appealed the people to donate generously so that the people affected by floods and landslides could be provided financial aid. Governor Acharya had said that landslides to sinking landmass in many areas, flooding and water-logging in the urban areas claimed 12 lives and more than 300 families were displaced in the State owing to floods and numerous landslides besides causing destruction to property.